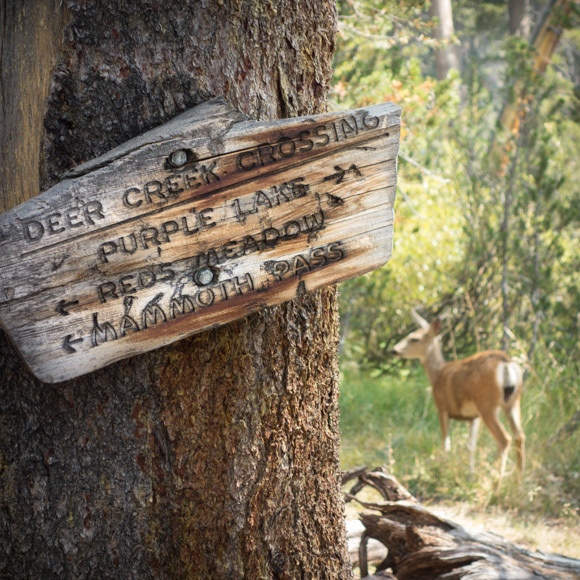 A double morale booster: a trail sign AND a wildlife sighting! 9. Second breakfast! I’m like most Americans; I’m constantly watching what I eat. How cool is it that we can add an EXTRA meal to our days while on the trail, and we can pretty much eat anything we want. 8. Wildlife sightings. I hike alone most of the time, so I tend to be a bit quieter than most groups. That means I get to see more wildlife. Trekking poles mean that I can be just a tiny bit less careful as I walk, which means I can look around almost all the time. I’m sure I’ve walked by my fair share of animals, but I’ve also seen many of the less-seen critters, including bighorn sheep, hares, raptors (low to the ground), bears, and even an American Dipper. 7. Trail signs. There are many wilderness purists who would like to remove every sign from the trail. Not me. They always give me a sense of making progress for the day, as well as confirming my navigation skills. The iconic ones in Yosemite are my favorite. 6. Amazing views. Here are some of the best: Vernal Falls, Nevada Falls, Half Dome, Cathedral Lakes & Peak, Tuolumne Meadows, Lyell Canyon, Rush Creek drainage, Mount Ritter, Banner Peak, Thousand Island Lake, Garnet Lake…and all this is just in the first third. There is no place on earth quite like the Range of Light. 5. A good nap. It’s a warm midday with the gentlest of breezes. I’ve just finished some salami & cheese and I’m ahead of schedule for the day. It’s quiet. I’ve found a shady spot with a small, symphonic brook tinkling nearby. Sweet dreams. 4. The perfect campsite. You don’t get one of these every night, but sometimes you get lucky. I’ve had some memorable ones. Sometimes they are near water, sometimes they have an amazing view, but always they are the perfect way to end, and then begin, the day. 3. Cell phone coverage. I know connectivity is not universally appreciated, but (as mentioned above) I usually hike solo. A brief conversation with my wife energizes me like a good night’s sleep or a zero day cheeseburger. 2. Getting to the top of a pass. When you arrive at the top of a pass, nothing can beat the feeling of accomplishment, the view, and the anticipation of a few miles of downhill walking. Bonus: you might even get some cell phone coverage. 1. Summiting Mount Whitney. No one understands that a JMT hike is more about the journey than the destination more than I do, but the feeling of standing atop the highest peak in forty-nine of the fifty states is pretty special. While standing there I always think of the towering peaks I’ve passed on the way: Half Dome, Banner, Ritter, Humphrey, Vidette, etc. It’s hard to believe that I am standing above them all! Oh, and knowing that a shower and a great meal is only hours away is kind of neat, too. Add #11: a nice dip in a lake or stream to rinse off accumulated trail dust and sweat. Nothing like that refreshing newly clean feeling to recharge your batteries! That’s a good one, Ken. Thanks for the comment! First, soaking your feet and letting them air dry. Let your toes out to run wild a freeeeee! They will appreciate it. Second, include some fun foods in your resupplies. These are things that maybe don’t meet your calories/ounce or calories/cubic inch targets, but you can consume them at your resupply point without having to worry about carrying them. I was using 24 ounce soda bottles for holding water, and so I included a bottle of pineapple soda (my favorite) at both Red’s and MTR resupplies, then I have replacement bottles handy. And after seeing Mile, Mile and a Half, I also included some Pringles at MTR. Both are great ideas, Steve, and the latter is something I’ve suggested myself on the blog. Thanks for the comment! Another nice things about the top of passes — EVERYBODY is going downhill!! Well put. Thanks for the comment.